I've been a bad blogger! One of the reasons I started the blog was to share my love of all things bow related and you know what, I haven't done a bow related post for AGES! When I was travelling I wanted to buy something bow related with Asian inspirations, but I found nothing! Slightly disappointing but I did get a few bow inspired bits and bobs over Christmas which I'll share with you in my outfit posts. 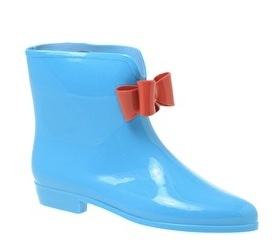 In one of my many bow related clothing searches on the internet I came across these beauties. 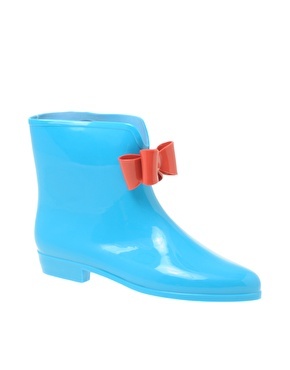 You'll probably recognise these as Viviene Westwood Anglomania x Melissa ankle booties and aren't they adorable. Apparently they have a thick sole which would make them perfect for this time of year with a constant will it wont it snow threat! They come in a few different colours and styles but I particularly love this bow pair and the colour is so bright and wonderful! Check out this crazy unrelated shoe as well, amazing! My alternative are these bow adorned wellies from Office which I normally wear to festivals or on wintery walks with the family. This was taken on our Christmas day walk on an iphone with that hipstamatic effect thingy. 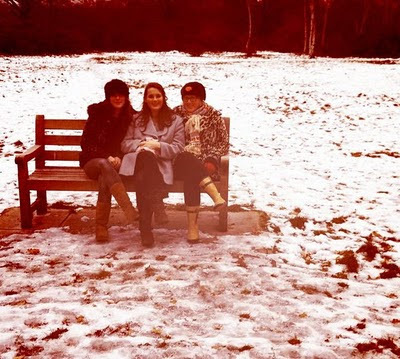 I love this picture so much, the 3 sisters, the snow and that vintage looking effect. I'm wearing my new leopard print coat from H&M, a new bunny hat from River Island and my Christmas scarf. G is having an early birthday party tonight because she dashes off to New York with K tomorrow and to say I'm slightly jealous would be a massive understatement! My trip to SE Asia bled me dry so I'm staying put in blighty. I met up with old friend T earlier today which was lovely, I love catching up with her because even though we don't see each other all the time, when we do spend time together it's like we've never been apart! they're so cute and different! wow, original! They would be perfect for festivals ! The bow ankle booties are amazing. I've never seen anything like them! And they do seem perfect for this time of the year. Those boots are awesome! They would be so great for the snow. Cute photo of you guys too!